B”H Yesod Yosef distributed Shabbos assistance to 10 poor families. One loan was granted through the Yesod Yosef Loan Gemach. 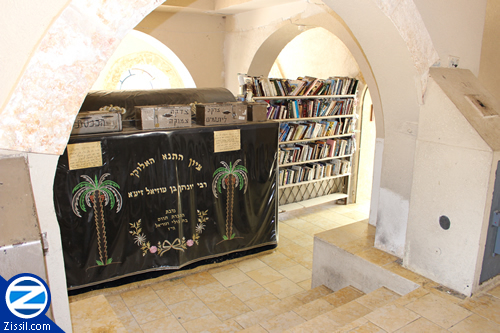 Donors were prayed for by the Kivarim of Yonasan ben Uziel, Antigonus Ish Socho, the Holy Arizal, Binayahu ben Yehoyada and Binyamin HaTzadik. This is aside from the name lists that are given along with each distribution and are likely to be mentioned by our recipients at many other Kivrei Tzadikim. Upon hearing this, Rabbi Yesa arose and poured date water and spiced wine into the mouth of the pauper. Sweat broke across the face of the pauper and his life returned to him. Later when Rabbi Yesa asked him what had happened, the pauper related how his soul had departed from him and was brought in front of the throne of Hashem the King. He had wanted to remain there but Hashem had desired to merit Rabbi Yessa with the act of saving him. Rabbi Yesa informed the people of the city and from that day on they cared for this pauper. We see from here that there are many needy people that are ashamed to ask for help and the people of their city are going to be judged and be held responsible for not going out of their way to seek these individuals out and assist them. As we near Pesach the expenses start pilling up. Think about all the extra money needed for cleaning, Matzos, Holiday meals and everything else that comes along with Pesach. It has long been a tradition in Jewish communities to donate Maos Chitim and provide help to families that can not afford all these extra expenses. 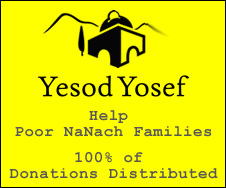 Yesod Yosef distributes 100% of these funds directly to poor families in Eretz Yisroel who are in a constant financial struggle and are definitely more needy around Pesach time. No Fundraiser Commissions! No Salaries! No Administrative Overhead! Pure Clean Charity!